The Red Solstice offers a new experience for fans of online squad-based shooters. Here’s our review. For the majority of its time in “early access”, The Red Solstice was strictly a multiplayer affair. It focused on cooperative online multiplayer for up to 8 players – and that’s really where its heart lies as well. Luckily though, the single player mode was never an afterthought or even just a simple tutorial to get you ready for the real stuff. Having said that – there IS a tutorial – and although it sets up the basics, it doesn’t do the game justice in exactly how deep the gameplay is. 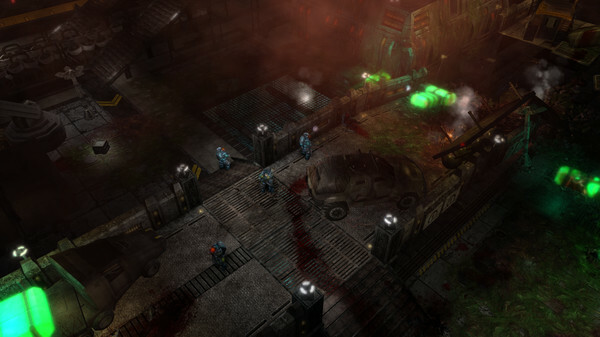 You see, the first time I saw screenshots of The Red Solstice, I thought this was going to be a twin-stick shooter. The isometric angle, the frantic shootouts – it had ‘action fest’ written all over it. The reality of the situation, however, is that this is a deeply strategic action game – think of it as X-COM meets twin-stick shooter, if you will. There are rpg-elements as well, where you level up and unlock new classes and abilities as you progress and keep you and your teammates alive. The latter is important, because you’re unlikely to survive on your own. As with many multiplayer-oriented titles, a careful balance between teammates is important. As a team, you need to keep everyone supplied with ammo, you need to heal those who are wounded, you need to take enemies out from afar and you need to take them out up close. Without a good team combination, your squad is very likely to fall apart and will fail to complete the mission. That’s not to say that balance is the surefire key to success here. You’ll still die often due to the harsh difficulty level, as well as some in-game frustrations that feel unfair – such as explosives that detonate in your face even though there’s a wall between you and where the shot was fired from. These are things that might be fixed in future updates, and don’t take away from the fun too much as it is because they’re not that frequent. Multiplayer is The Red Solstice’s strong suit – with a real sense of ‘sticking out for each other’ at the heart of the experience. Single player gaming can’t reproduce that type of gameplay, so it’s good to see that the developers didn’t just throw in some AI bots and called it a day. Instead, the solo experience was designed to be more real time strategy-like, where you command an entire squad. To make decision-making – as well as controlling several extra players at once – easier, the single player mode also incorporates a slow motion feature, which allows you to slow down the action and dish out commands before resuming the carnage in real time. Had The Red Solstice been built from the ground up as a ground player game, it wouldn’t have been the rewarding experience that it now is. It would have been okay, but not all that memorable. The inclusion of co-op multiplayer, and the way it’s been implemented, elevate the game and make this a worthwhile purchase to everyone who enjoys team-based online gameplay.